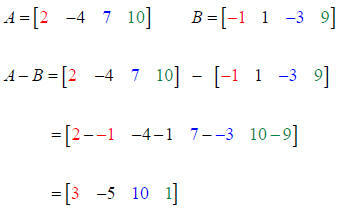 Addition of two matrices . Multiplication of a Matrix by a scalar. Subtraction of two matrices : two ways to do it. Combinations of Addition, Subtraction, Scalar Multiplication. An operation is a way that we combine two elements. Combining elements that are rational numbers ( fractions ) using the operation of addition. Combining elements that are integers using the operation of division. FAQ topics listed on the Online Math Center . in the same row-column location. elements in the Matrix and multiply. To subtract Matrix A and B, simply subtract corresponding row-column elements. 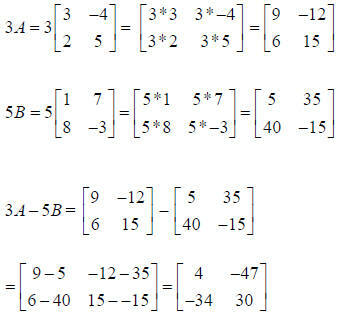 Example 1: Subtract Matrix B from Matrix A. Both are order 2 x 2. 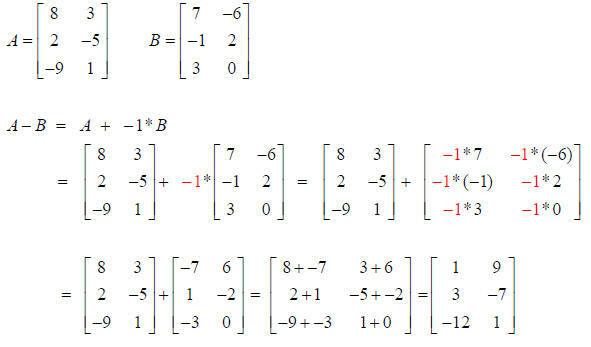 Example 2: Subtract Matrix B from Matrix A. Both are order 1 x 4. Matrix C is a 3 x 3 order Matrix. Matrix D is a 3 x 1 order Matrix. Since the order of the two matrices is different , they can NOT be subtracted. The negative sign in front of the second Matrix is actually the scalar “ −1”. Distribute the scalar “ −1” to all elements in the second Matrix. the same number of columns as B.
Matrix A is 2 x 3 (2 rows, 3 columns). Matrix B is a 3 x 3 (3 rows, 3 columns) Matrix. The columns in A equal the rows in B, so we can multiply A*B producing a 2 x 3 Matrix. However, the columns in B do not equal the rows in A, so we can not multiply B*A.
equals the number of rows in B. 2. Set up the new, blank (m x p) Matrix. row 1 column 1 of the new Matrix. new Matrix at the row-column location identified. 5. Continue until all row-column locations of the new Matrix are filled. columns in A equals the number of rows in B, so the two matrices can be multiplied. element in column 1 of Matrix B. For row 2, column 1 multiply row 2 of Matrix A and column 1 of Matrix B. There is only one element in the new matrix: the row 1, column 1 element.